The Tilting Deck Vertical Transfer Unit from Glide-Line allows for vertical transfer of a product and has the ability to tilt the conveyor deck (our current design is up to 30 degrees, but we could increase). This provides access to the product being transported vertically for visual inspection or other automated processes. Whereas our competitors don’t have a standard option for a conveyor mechanism like this, Glide-Line builds this component as a standard, with our clients able to customize the angle of the tilt to exactly what they need. The Tilting Deck VTU is a standard Vertical Transfer Unit with the addition of a tilting transport deck conveyor. The tilt feature is controlled by the VTU servo/motor. The deck itself is hinged on one side and loose on the other, allowing different Z-axis movements to provide various tilting angles. The step-servo control of the z-axis allows maximum tilting flexibility, so various angles and access points are all possible. Glide-Line’s VTU supports the product in all four corners; our competitors’ VTUs are single, typically pneumatic, cylinders on one side. This makes it difficult to tip or tilt the platform on a competitor’s platform because a single cylinder cantilevers all the product weight from one spot. Tilting throws the center of gravity off; we account for this by shifting the weight (since we support the platform from four corners) instead of throwing the weight. This also gives clients more control over the product itself. Our conveyors are built to be flexible, so creating an innovative tilting VTU met client needs and was simple for us to do. This easily configurable unit uses core Glide-Line products so it’s simple to manufacture, which keeps lead times minimal. A robot couldn’t effectively reach to see the product naturally. 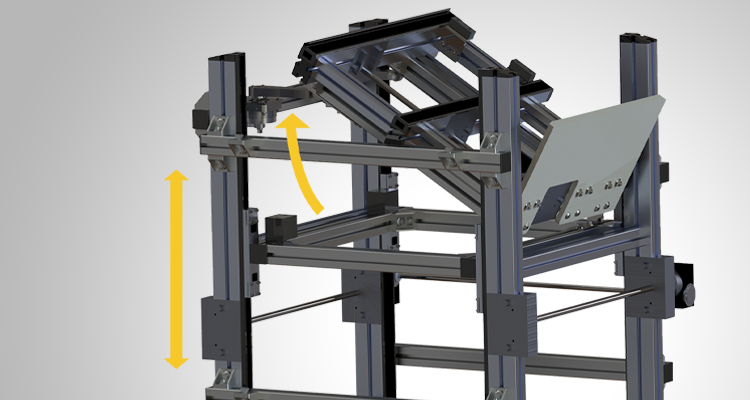 The Tilting Deck VTU enables the robot to stay in place while the pallet tips to the correct angle. Operators benefit from the tilting deck as well. If someone needs to access a product on the far side of the pallet, this helps them reach it better without bending or straining. This ease of access to the product for a process function helps make the process more efficient. The Tilting Deck Vertical Transfer Unit solves what could be a very expensive problem very simply. No matter the size or weight of your client’s product, the tilting deck helps with visual inspection or simple product positioning to improve operations in the process.